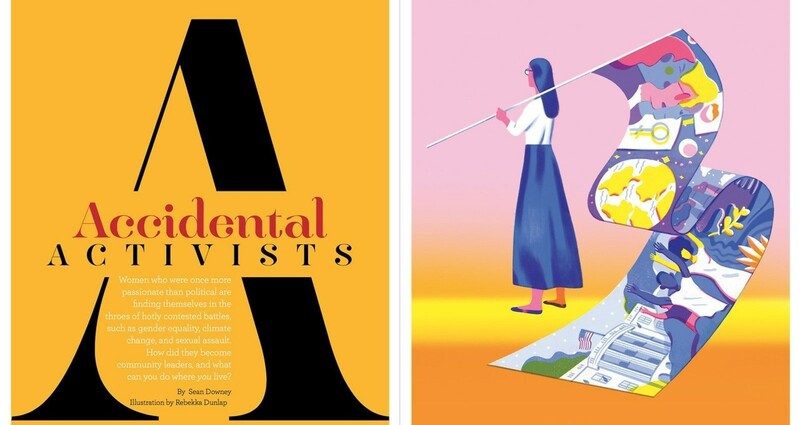 "Accidental Activists" is a full page illustration that appeared in the May 2017 edition of Real Woman Magazine. 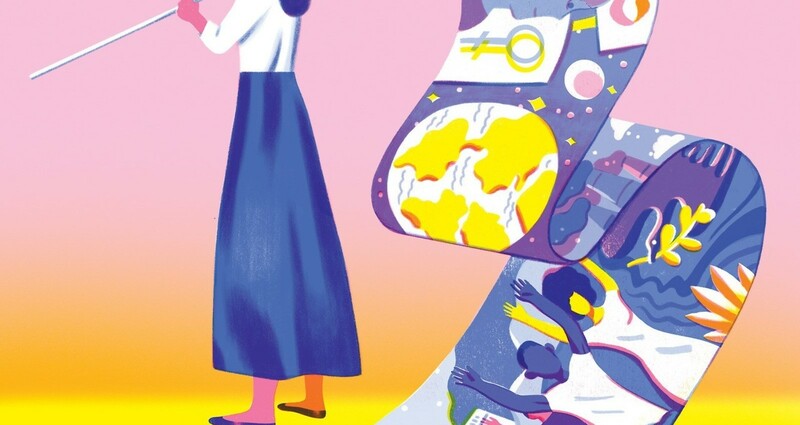 Art Directed by Jessica Downey and illustrated by myself, it stands alongside an article about woman leaders who were drawn to organization and activism work after, and partly due to, the 2017 United States Presidential Elections. The objective of this piece was to encapsulate the defiant yet hopeful nature of women organizing aid for civil rights activism and legislation.. After discussing if we should depict the movement as a whole or focus on an individual's drive to make a difference in the lives of marginalized peoples, we went with the latter landing upon the singular figure that stands iconically facing away from us. The anonymous woman holds a flag that has a deluge of symbols flowing into one another, illustrating the different focal points and grey areas in contemporary activism. The hope, and I think we succeeded, is that the figure through their contemporary, yet classic dress, and anonymity, would be a figure that many women could see themselves in. Though activism often happens in large groups in the form of protest, the catalyst is often a moment of deep reflection and ultimately courage in taking a concrete step towards action. The greatest technical challenge of this particular piece was to utilize and integrate the knowledge I was learning while working in the SVA Risograph Studio. My aim was to, through a digital process, fulfill both my thirst for experimentation as well as the obvious professional need to delivery a polished Illustration to my Art Director. Wanting an illustration that could exist between the personal art practice and my freelance I used a layering technique that would imitate the color overlays and blending that naturally happens when running prints through a two drum Risograph Machine. (In short, Risograph is a mechanized and digitally integrated screen printing technique. You can either scan or send a digital file which the machine creates a stencil out of. Then as it runs over a specific drum it pushes the ink through the stencil creating your design) The result is an image that digitally and as a physical print drowns in interlocking color. Giving the digitally created image the weight of something that can exist in the real world was the greatest and most fulfilling design challenge of this assignment.